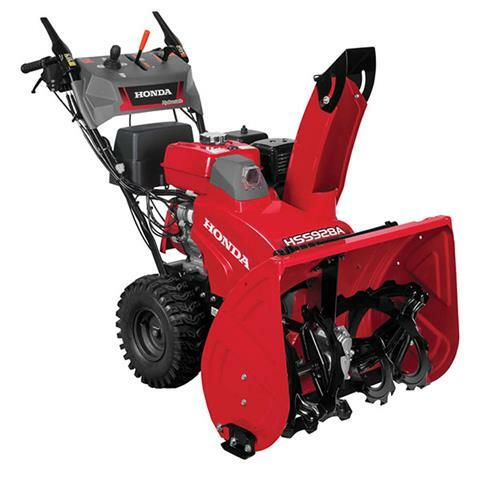 POWERFUL, EASY TO START HONDA GX ENGINE: The commercial grade Honda GX270 OHV engine offers plenty of power to churn through the snow. Starting is easy - even in cold weather. 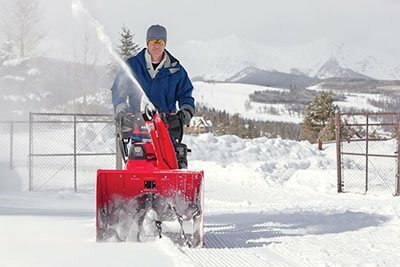 ELECTRIC START - NO PLUG IN REQUIRED: Automotive-style DC electric key starting makes your snow blower even easier. Comes standard with recoil pull-start, for back up purposes. 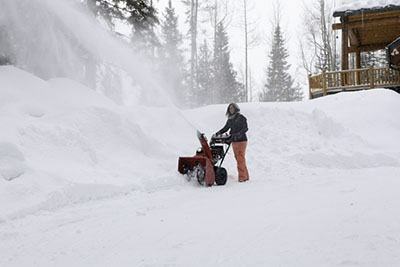 EXCEPTIONAL THROWING DISTANCE, 52 FT. MAX: Two-stage snow blowers use a fast spinning impeller in the discharge duct to throw snow faster and farther. The HSS928 has a larger impeller diameter for increased snow removal - offering throwing distances that exceed many competitors. CLEAR UP TO 1900 POUNDS PER MINUTE: The combination of Honda's GX series engine, optimized impeller pulley, and 90 degree impeller wing dramatically optimizes Honda's HSS series snow throwing capacity. 28 IN. CLEARING WIDTH, 21.7 IN. CLEARING HEIGHT: The HSS928 can handle large snowfalls with ease. LARGE 14 IN. TALL PNEUMATIC SURE-GRIP TIRES: The HSS928AW and AWD offer superb maneuverability on smooth surfaces with 14 in. tall pneumatic, sure-grip tires. The tires feature a retooled, aggressive directional tread pattern. Wheel drive offers great traction and easy maneuverability on flatter areas. Chains are not required under normal snow conditions. HYDROSTATIC DRIVE. PICK THE RIGHT SPEED FOR YOU, WITH AN EASY SINGLE LEVER CONTROL: Control of forward and reverse speed is simplicity itself with Honda's hydrostatic transmission. Just move the lever forward or backward to go in the direction you want, at the speed you want. Infinitely variable speed means it's easy to pick a speed to match your snow conditions and personal preference. There's no shifting, and the ground speed doesn't affect the auger rotation speed. It's easy to control, and virtually maintenance free. ELECTRIC JOYSTICK CHUTE CONTROL. EASY TO ADJUST SNOW DISTANCE AND DIRECTION: The all-new electric 4-direction joystick chute control lets you reposition the chute on the go. With up to 198 degrees of rotation, the joystick chute control allows you to clear snow faster and more efficiently. CONVENIENT CONTROLS: The HSS928 offers ergonomically-designed controls for operator convenience and safety. Controls are conveniently laid out and easy to reach. AUGER PROTECTION SYSTEM: The HSS928's auger drive shaft and impeller blower are protected by easily replaceable offset shear bolts. Should the auger engage a solid object, the shear bolt will break to prevent auger or impeller shaft damage. THROTTLE CONTROL: The throttle control lever provides manual control of the engine speed. Maximum discharge - 1,900 lb. / min.